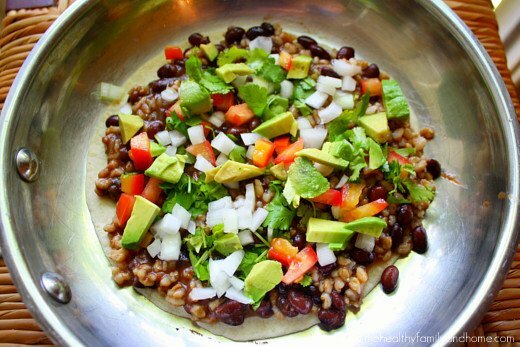 Vegan Black Bean and Cilantro Quesadilla…a quick and easy meal that’s budget friendly, vegan and dairy-free. These Vegan Gluten-Free Black Bean and Cilantro Quesadillas are always a favorite with my family and can be made vegan or non-vegan and easily adapted to gluten-free. I like them because they are fairly quick and easy to make and they can be customized to each persons preference. This recipe is part of my “TRANSITIONAL” recipe category for those meals that use minimal, quality processed ingredients and don’t require a lot of time and preparation. I like to think of them as “healthy short cut” recipes. They are still made with quality ingredients but some are already prepared which can be used as a short-cut to save some time in the kitchen. The rest of the ingredients are fresh and you can use any combination that you like. 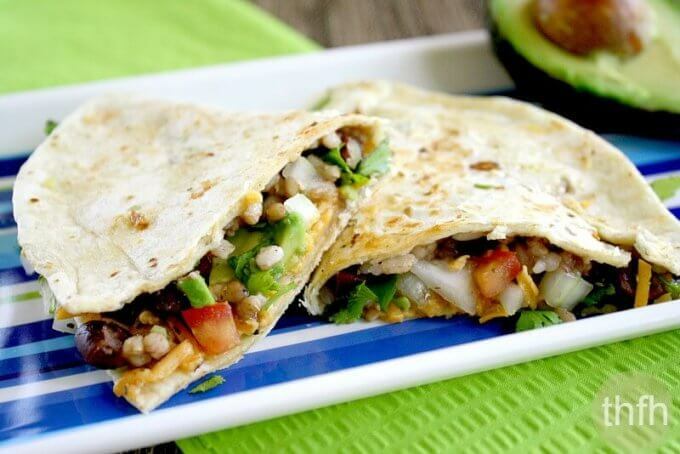 In this quesadilla, I used black beans and rice, avocados, cilantro, onions, and tomatoes. Want more healthy meal and entree recipes? Check out Creamy Vegan Tomato Basil Soup, Creamy Vegan Vegetable Minestrone Soup, Spicy Roasted Butternut Squash Pasta or my Clean Eating eCookbook with an entire chapter of 20 healthy, clean eating meal and entree recipes that you will love! Tip #1: GLUTEN-FREE OPTION: If you’d like to make this gluten-free, just use your favorite gluten-free tortilla wrap. Tip #2: NON-VEGAN OPTION: If you don’t need this to be vegan, just use your favorite organic shredded cheese. Step 1 Dice fresh veggies up in to small pieces. Place a tortilla in your skillet (with a touch of coconut oil). 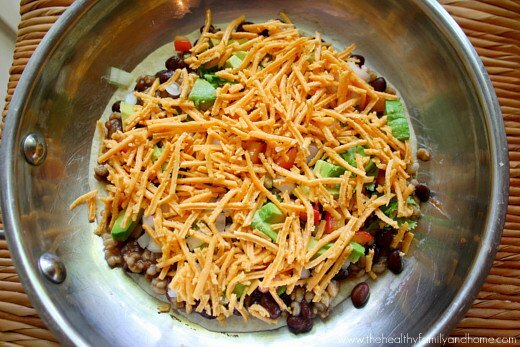 Add a layer of beans/rice, sprinkle with veggies of your choice, then sprinkle with shredded cheese of your choice. Top with another tortilla and heat only long enough to melt the cheese and for the outside of the tortilla to get lightly brown, carefully flipping if necessary. 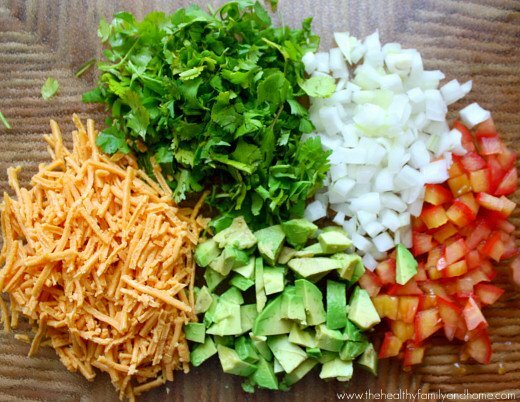 Remove from skillet and cut into half or quarter pieces and serve with fresh guacamole or salsa. 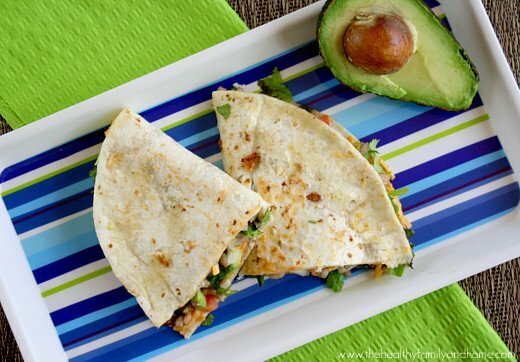 Repeat for as many as you'd like to make, usually 3 whole quesadillas. This recipe will make approximately (3) full quesadillas or (6) half pieces or (12) quarter pieces. The recipe and photographs for "Vegan Gluten-Free Black Bean and Cilantro Quesadillas" by Karielyn Tillman of The Healthy Family and Home are licensed under a Creative Commons Attribution-NonCommercial 4.0 International License and cannot be used without my written permission. If there is wheat flour in the tortilla..how is this gluten free? Hi there Karen! When I make these at home, I use both versions of tortillas. I use the 365 Organic Tortillas, which are not gluten-free, because my boy’s are not on a gluten-free diet. And when I make them for myself, I use a gluten-free tortilla. However, the regular tortillas with wheat can easily be substituted with a gluten-free or homemade tortilla, as I indicated in the post, in the recipe, and even gave a link to a gluten-free brand. It would be the same as when a recipe calls for “bread”…instead of using regular bread, just substitute it with a “gluten-free bread”. Hey, I really love this site and was wondering if you could you make home made vegetable tortillas? I am 16 and I make my lunch for school weekly. I had to change this recipe up a bit to make it work. I didn’t add the avocado because of how easily it goes bad and instead of putting it on a tortilla I put it in my my thermos to keep it nice and hot. It was delicious! This was my test run recipe for this site and it turned out delicious! I will be sure to try many more! That was a great idea to use the thermos and the good thing about quesadillas is you can mix and match your favorite toppings or, whatever will work in a packed lunch situation just like you did.